In stock -This product will ship today if ordered within the next 13 hours and 15 minutes. This carefully designed formula aids the digestion of foods, leaving you free to enjoy your favourite meals again. Enzymes have no taste. For best results, open up and mix the contents of one capsule of digestive enzymes throughout cold or warm (but not piping hot) foods, or swallow capsules during the meal. It is most important to take digestive enzymes with foods that are rich in proteins. Udo’s Choice Ultimate Digestive Enzyme Blend comes in 100% vegetarian capsules and is made from 100% plant-based digestive enzymes using the solid state fermentation method. These enzymes are expressed in guaranteed FCC units of activity. This is internationally recognised as the most accurate method to express levels of enzyme potency. In case of ulcers, do not take on an empty stomach. 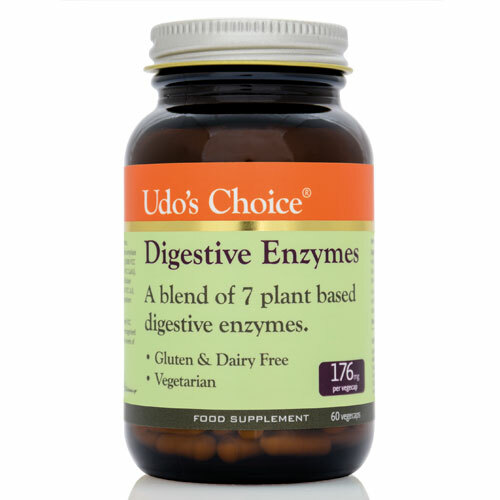 Below are reviews of Udos Choice Digestive Enzyme Blend - 60 Vegicaps by bodykind customers. If you have tried this product we'd love to hear what you think so please leave a review. In fridge awaiting next tummy flare. Bought as reviews were good. But not needed to try yet. As insurance they are working a treat hey? I always keep this product in my cupboard and take it when I go out for meals. I have some food intolerances and these enzymes definitely help. I don't have to be scared of enjoying my food. I MUST SAY THAT IM BLOWN AWAY udos digestive enzyme blend, amazing, i suffer from a lot of problems with my gut and tummy for many years and tried almost everything on the market but did not work for me and i must say hand on heart ,this product works for me. thank you bodykind,i will buy this product again. fab. Great, very happy as a long-term user. great. longtime user and always found beneficial. Having tried many other digestive supplements, I am so pleased I have found Udos choice, by far the best. Helps relieve bloating etc. Will be buying again. I've taken about half of the first jar I've bought. They seem really good, don't think you can go far wrong with Udos Choice products. Will definitely order more. Notice a difference when I stop taking these resulting in sluggish digestion would recommend them for anyone with digestion difficulties. excellent, but got a bit expensive these days. Due to surgery damage, I have huge difficulties re. digestion and coping with solid food. When i'm suffering with severe bloating, stomach pain alongside allergies from certain foods, these vegicaps have rescued me. They take very little time to begin helping and make a huge difference. I have been taking this particular form of digestive enzyme for some time as I suffer from IBS and also a mild hiatus hernia. I find them very effective before meals and I have found I do not need to take omeprazole.This brand does not contain papain which is related to latex of which I have an allergy to. Just ordered a second bottle as these really do help with my digestion. Always suffered with my tummy, diagnosed with IBS..eat a very healthy diet but suffer with anxiety which really effects my stomach. However taking one of these after my main meal has made such a huge difference. i had digestive problems that the doctors have been unable to resolve for seven years, constant belching, feeling full for hours after meals, palpitations from a build up of gas affecting the vagus nerve and acid problems... i can't promote these enzymes enough, they have helped enormously, I finally have something to treat my problems with and allow me to eat what i like. Excellent product allows me to indulge in foods that previously would make me bloat! These in my opinion are the best digestive enzymes and really helpful. Also contains no Betaine HCL. Not cheap, but for me in France it's great to get them from here and really good postage costs. 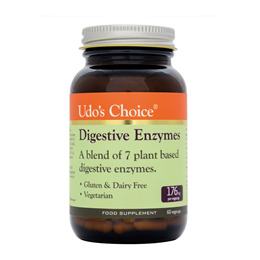 Udo’s Choice Digestive Enzyme Blend contains 7 active plant-based enzymes chosen to assist the breakdown of proteins, fats, carbohydrates and fibre. They do this by providing enzyme activity combinations.